Measuring the performance of an app is the first step in optimizing it. 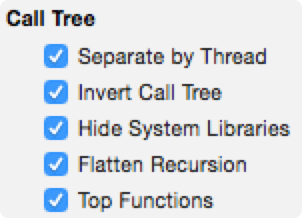 Lucky for us, Apple's developer tools have plenty of profiling features. Let's take a look at one, Time Profiler. It's claim to fame is helping us fine tune performance by tracking down slow functions. We start by opening our project in Xcode, and selecting Product > Profile from the menu. This will build our app, and launch Instruments. When it does, we'll select the Time Profiler Instrument and click Profile. Now the fun part: We click 🔴 in the top left and Instruments will launch our app, and begin measuring its performance. One common way to use Time Profiler is to discover any under-performing functions that might be bogging down our main thread.